As paper slips right through the sheet-fed scanner, scans are saved automatically into the built-in memory and ready to be sent via Wi-Fi to your smartphone, iPad, iPhone, Android tablet, Windows® or Mac® computer. Even better, dedicated easy-to-use iOS/Android™ apps are available online to facilitate the Wi-Fi transfer to your mobile device! Readiris 14 lets you create compressed and searchable PDF files compatible with virtually any computer. The produced PDF will look exactly the same as the original scan, but its size will be up to 50 times smaller and a text layer ready to be searched will be added. It is now very convenient to find the exact information you are looking for amongst tons of archives, and the size of your digital documents will no longer be an issue while being stored or shared! No matter how high the pile of paper you need to scan, the provided world-renowned OCR software Readiris 14 will extract all key information easily. Your documents are turned into fully editable files in Word, Pages, Excel, etc. ready to be shared in the Cloud (Dropbox, Evernote, Google Drive, Skydrive, and more). Store, access and manage your converted documents from any computer, tablet or mobile phone using Readiris 14's new Cloud connector. Simply select your favourite Cloud hosting service after the conversion process and your document will automatically be exported, ready to be accessed anywhere you are! All your digital archives will now be safely backed-up and accessible when and where you need it the most! Supported Cloud services: Evernote, Dropbox, Box & Google Drive. The IRIScan Pro 3 Wifi allows you to quickly scan the stack of business cards you have been collecting for so long. You can then automatically extract all their data with the provided business cards recognition software Cardiris, and export your digital contacts to Outlook, Excel, Salesforce, ACT!, and more. Thanks to the scanner’s dedicated slot, you will even be able to scan your ID and credit cards in a snap! Manage your documents and content by optimizing the document workflow. The included document management system IRISFile helps you centralize all your files in a secured and electronically accessible environment. Thanks to this easy-to-use document management system, your electronic documents can then be shared with clients, colleagues and family, to name a few. You will even be able to give restricted access to some, and more to others. The IRIScan Pro 3 Wifi features a TWAIN driver. TWAIN compatibility allows this portable scanner to work with virtually any document management software that has a scanner interface. 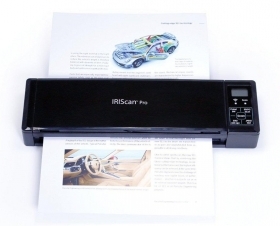 Just connect the IRIScan Pro 3 Wifi to your laptop via USB, and control the scanner directly from your favorite software.